The Blackmagic Design UltraStudio 4K Thunderbolt 2 is an external 1RU/table-top I/O device with two 20Gb/s Thunderbolt ports. It captures DCI 4K 4:2:2 or UHD 4K YUV 4:2:2 by single-link 6G-SDI up to 30p and by dual-link 6G-SDI from 50p to 60p; 1080p RGB 4:4:4 by single-link 3G-SDI; 1080p 4:2:2 by single-link HD-SDI; 1080p 4:4:4 by dual-link HD-SDI; and DCI/UHD 4K 4:2:2 by HDMI. 4K can be input/output compressed and uncompressed. The SDI inputs also support dual-channel 2D/3D stereoscopic workflows. UltraStudio 4K is capable of hardware-based HD down/up/cross conversion. The other connections are Component and Composite on BNC, 2-channel analog audio on XLR, 2-channel AES/EBU audio on BNC, timecode input and output on XLR, Blackburst and Tri-Sync, and RS-422 deck control. A color LCD and six quick-access video and audio input buttons are built in on the front panel. 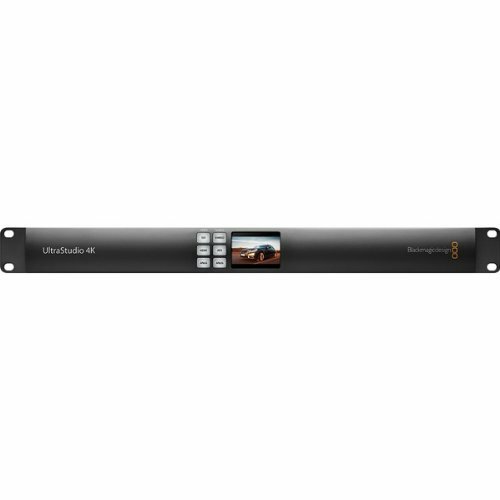 Purchase Blackmagic Design UltraStudio 4K at Discounted Prices ✓ FREE DELIVERY possible on eligible purchases.